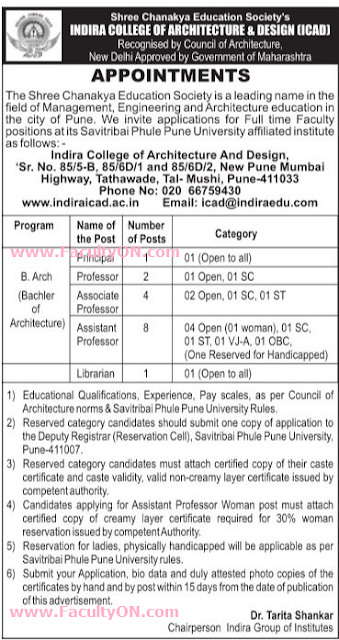 Indira College of Architecture and Design, Pune has advertised in the LOKSATTA newspaper for recruitment of Professor / Associate Professor / Assistant Professor / Principal Plus Librarian jobs vacancies. Interested and eligible job aspirants are requested to apply within 15 days from 12th July 2018. Check out further more details below. About College: Indira College of Architecture and Design (ICAD) is one of the ventures of the prestigious Shree Chanakya Educational Society (SCES), which has proved its metal in educational field over the past two decades. How to Apply: Interested and eligible candidates are requested to submit their application, bio data and duly attested photo copies of the certificates by hand or by post within 15 days from the date of publication of this advertisement.